Is Your Kid Getting Bullied? In the past few weeks, we have received mails about kids getting bullied and the impact this has had on them. So, we thought of writing an article on the same for parents to get an insight into this sensitive issue. Bullying is an aggressive behavior intended to harm the other person. The person who is bullied may perceive it as a small incident or a big incident. It can turn into a big incident for children who are still young. 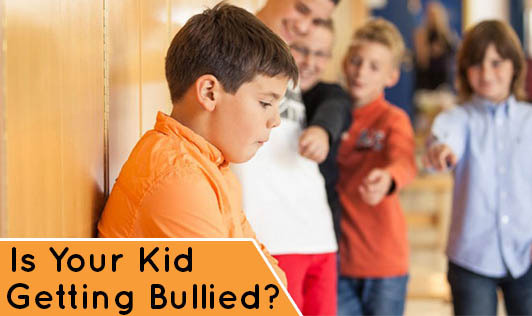 When children get bullied, they begin to react differently like cry alone, avoid going out to play, have disturbed or sleepless nights, pain in some part of body that can't be expressed, etc. Parents should observe these actions in kids and should tackle them in a positive way so that the child will get out of it. 1.Talk about it: When you feel your kid is lacking concentration in his day to day activities like watching TV, playing or studying- talk to your kid. Ask him about his routine, his play time, his favorite game, and his friends. He might make a mention of being bullied. 2.Tell him you are there for him: Due to fear, kids might not come up to you saying that they are bullied. Give them confidence that you are always there for him, hold his hand, hug him and tell him that he is your favorite. This will make the kid happy and also build up his confidence. 3.Take him out: Change in place always refreshes the mood of anyone. It's a good chance to find out what is happening at your kid's end. 4.Talk to other parents: You can talk to parents who have also faced the same problem with their children. They can help you in giving ideas to get your kid out of it. 5.Help them handling: Increase your child's self confidence, and explain to him how well he can deal with people who will bully him. Teach him to stay calm and not react by crying, shouting etc. 6.Personality development classes: Take him to personality development classes where his self confidence level increases. Go along with him; tell him you are there for him. Learn with him, explain things to him. It's important to take bullying seriously. Long term bullying can have a lot of negative effects on a child's mental health like lack of concentration, being dull always, inactivity etc. Your child may not be physically and mentally active. It would be better to keep in touch with your children's class teacher and their friends to keep yourself updated about what is happening at their end. Maintain a friendly relationship with your child always.